How fast can I handle the part? How fast can I package the product? How fast can I ship the product? Handling, packaging and shipping products with paint that is not fully dry and cured can lead to many problems. Complaints caused by missed shipping dates due to waiting for paint to harden. Rejects and returns due to parts sticking together or sticking to packaging materials. Loss of goodwill due to poor coating appearance. It is generally recognized that time and temperature affects the rate of most chemical processes, including the drying and curing of paint. For example, higher temperature for a given length of time generally results in faster drying and curing of a paint. The type and weight of the part being painted. How the heat is generated and transferred to the coating. The ability to measure the temperature of the painted part. The ability to maintain a constant temperature. 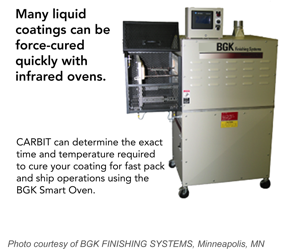 Carbit Paint Company in Chicago can help determine how to dry paint faster through the use of its BGK Infrared Smart Oven. This oven has a microprocessor that links fast response, short wave infrared emitters to internal pyrometers (thermometers) that measure the temperature of the painted surface. The combination of fast emitter response and measurement of the part temperature provides a constant temperature for a specified period of them. This control allows exact correlation between time and temperature and will answer the question, “How can I dry paint faster”. I’ve previously commented that uncured paint often delays shipments or results in complaints when customers unpack their products and discover damage. Fortunately, infrared ovens can force-cure coatings and eliminate these delays and complaints. Predicting delays or complaints can be as difficult as predicting the weather, which in fact has a lot to do with the problem. One day the paint is dry and hard. The next day it remains soft and sticky. To understand the problem, it is helpful to make the distinction between “drying” and “curing” of a coating. A coating is dry when the carrier (water or a solvent) evaporates and leaves the paint. At that point, the paint is dry-to-touch and can be handled. Curing is more complicated and occurs when the resin in the coating forms a solid film. The curing process generally takes longer than the drying process and is very dependent on temperature. Most coating performance properties require that the coating be cured, not simply dry. For example, film hardness, blocking resistance (surface defects from early coating contact with another surface), chemical, moisture, and abrasion resistance are achieved only when the coating is fully cured. Understanding the distinction between drying and curing helps explain why complaints are more common in cool weather. The coating may feel dry-to-touch, but it is not fully cured and hard. Surface defects occur when the parts stick together or are prematurely damaged by contact with packaging materials. The classic answer to this problem is to switch to a coating that requires baking the coating in an oven to “cure” it. Bake coatings can be liquid or powder, and will form a film only when exposed to high temperatures, usually 300° – 450°F. A less expensive option is to add a heat source to force-cure a coating that would otherwise dry and cure by itself if given sufficient time. This can be done efficiently by adding infrared (IR) heaters in the process line to force-cure the coatings to allow for fast and problem free shipments. 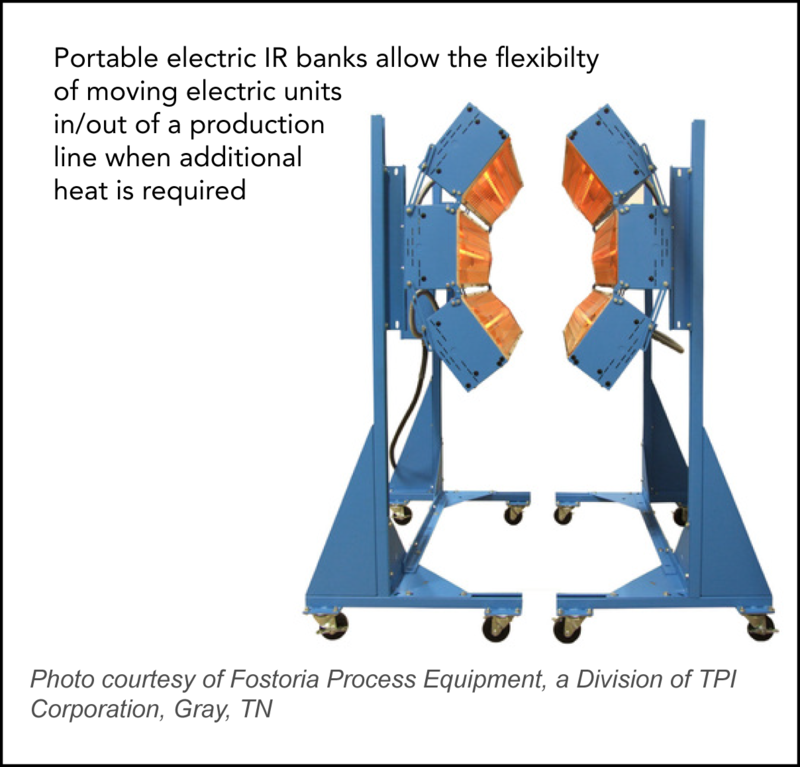 IR introduces less heat into the work environment. Paint manufacturers, like Carbit Paint Co. in Chicago, have programmable IR lab and conventional baking ovens that can help determine whether a conventional baking system or force cure systems with infrared will best prevent delays in shipments or complaints due to under- cured coatings.